Although we have a modest shelf of books for our guests at our condo (and usually add a few more volumes to it whenever we are there), it's just not possible to anticipate everyone's tastes when it comes to beach reading. So knowing where a good hole-in-the-wall neighborhood bookstore can be found wherever you are vacationing is a valuable piece of information. And, I don't know about you, but I have long preferred to buy used books whenever I can - and I kinda' like a smaller store, when I'm relying on Serendipity rather than a looking for a particular title. 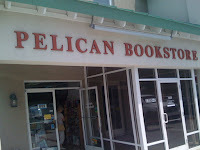 The Pelican Bookstore offers a good selection and at reasonable prices, plus . . . well . . . charm. Another piece of useful information is that when we were there last, we noticed that they also have a computer (with Internet access, of course) and printer, on which you can rent some time. It's nice to know about, in case you have a need. I mean, who wants to drag along all your peripherals to the beach? Well, when we first discovered Sunset Beach, NC, all we knew about it was what we saw: the prettiest, smoothest, broadest, most-peaceful beach we had experienced over a whole summer of exploring the coast of North Carolina. And this was right smack dab in the middle of high season (You see, we're not fond of crowds)! It wasn't until after we found our little peace of heaven nearby, took the plunge and signed the papers, that we found out how truly special this particular beach is. Sunset Beach is a South-facing beach. Spend the whole long day hanging out on the broad expanse of fine sand that is Sunset Beach, and you'll notice that the sun rises over the east end of the beach and sets over the west end. And yes, when you look out to the ocean, you are facing due South! In fact, our beach is the southern-most beach in North Carolina. Just north of Myrtle Beach, South Carolina, and about 45 minutes south of historic Wilmington, its unspoiled, serene beauty and its family-oriented atmosphere makes this my favorite Carolina beach of all. 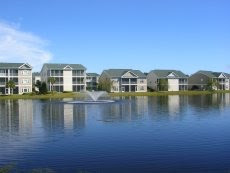 Only three miles long, Sunset beach was the last of the South Brunswick Isles to be developed. Perfect for true beach lovers who don’t demand staying on the doorstep of amusement parks, multi-layer tourist shops or bright lights as part of their vacation experience. However, close enough to make excursions to all the hottest attractions, after which, you can retreat back to this peaceful and beautiful coastal haven. Ahhhhhhh . . .